According to the functionalist perspective, race and ethnicity are two of the various parts of a cohesive society. Classical functionalist theory did not develop specific analyses of race and ethnicity; it viewed them as constituent elements of society that contributed to its relatively smooth functioning. Functionalism emphasizes social unity and equilibrium and has been criticized for being unable to account for social conflict and systematic inequalities such as race, gender, and class. Since structural functionalism generally stresses the unifying role of culture, it is ill-equipped to understand divisive forces like discrimination. structural functionalism: A sociological approach that looks at society through a macro-level orientation, which is a broad focus on the social structures that shape society as a whole. Functionalism addresses society as a whole in terms of the function of its constituent elements; namely norms, customs, traditions, and institutions. In the 1960s, functionalism was criticized for being unable to account for social change, or for structural contradictions and conflict (and thus was often called “consensus theory”), and for ignoring systematic inequalities including race, gender, and class, which cause tension and conflict. As noted sociologist Michael Omi observes, “The structural-functionalist framework generally stressed the unifying role of culture, and particularly American values, in regulating and resolving conflicts. This approach was notably in evidence in respect to the sociology of race” (Coulhan 2007, Sociology in America, p.559). From this perspective, societies are seen as coherent, bounded, and fundamentally relational constructs that function like organisms, with their various parts (such as race) working together in an unconscious, quasi-automatic fashion toward achieving an overall social equilibrium. Given this emphasis on equilibrium and harmony, the functionalist perspective easily allows for specific macro-analyses of more contentious power imbalances, such as race-related issues. It also allows for the micro-analyses that much of modern sociology is oriented around, such as identity formation and the socially constructed nature of race. It is less well-adapted to understanding individual discrimination because it ignores the inequalities that cause tension and conflict. During the turbulent 1960s, functionalism was often called “consensus theory,” criticized for being unable to account for social change or structural contradictions and conflict, including inequalities related to race, gender, class, and other social factors that are a source of oppression and conflict. 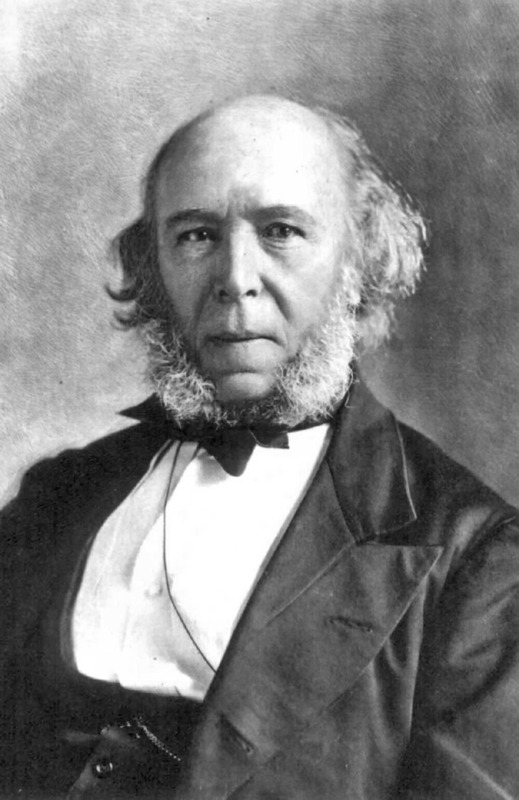 Herbert Spencer: Herbert Spencer was an English philosopher and social theorist. For Karl Marx, class conflict was most prominent; other theorists saw racial and ethnic conflict as more significant. The feminist theory of intersectionality suggests that different biological, social, and cultural categories, such as race, ethnicity, and gender, interact and intersect to form a system of oppression. Since the social, political, and cultural upheavals of the 1960s, there has been a wellspring of conflict theory-inspired analyses of race and ethnicity. W. E. B. Du Bois theorized that the intersectional paradigms of race, class, and nation might explain certain aspects of Black political economy. Intersectionality: The idea that various biological, social, and cultural categories– including gender, race, class, and ethnicity– interact and contribute towards systematic social inequality. The classical conflict perspective pioneered by Karl Marx saw all forms of inequality subsumed under class conflict. For Marx, issues related to race and ethnicity are secondary to class struggle. Other early conflict theorists saw racial and ethnic conflict as more central. Sociologist Ludwig Gumplowicz, in Grundriss der Soziologie (Outlines of Sociology, 1884), described how civilization has been shaped by conflict between cultures and ethnic groups, theorizing that large complex human societies evolved from war and conquest. Since the social, political, and cultural upheavals of the 1960s, there has been a wellspring of conflict theory-inspired analyses of race and ethnicity, many of which eventually developed into an overlapping focus on the intersectional nature of various forms of conflict and oppression. Intersectionality is a feminist sociological theory first highlighted by leading critical theorist thinker Kimberlé Crenshaw (1989). The theory proposes that different biological, social, and cultural factors, such as as gender, race, and class, do not operate in isolation of one antoher. Rather, they are interrlated, forming a system of oppression that consists of different forms of discrimination. This theory will be further discussed under the feminist perspective of gender stratification in the chapter, “Understanding Gender Stratification and Inequality”. W. E. B. Du Bois theorized that the intersectional paradigms of race, class, and nation might explain certain aspects of Black political economy. Sociologist Patricia Hill Collins writes “Du Bois saw race, class, and nation not primarily as personal identity categories but as social hierarchies that shaped African American access to status, poverty, and power” (2000 Black Feminist Thought: Knowledge, Consciousness and the Politics of Empowerment, 42). One of the most influential symbolic interactionist theorists on race and ethnic relations was Robert Park. Evolving out of the mid-20th century “Chicago School” of urban sociology, Park created the term human ecology, which borrowed the concepts of symbiosis, invasion, succession, and dominance from the science of natural ecology. One crucial psychological finding is that members of stereotyped groups internalize those stereotypes and may suffer as a result. Stereotype Threat is the experience of anxiety or concern in a situation where a person has the potential to confirm a negative stereotype about their social group. If negative stereotypes are present regarding a specific group, they are likely to become anxious about their performance which may hinder their ability to perform at their maximum level. Stereotype Threat is a potential contributing factor to long-standing racial and gender gaps in academic performance. Advocates of Stereotype Threat explanation have been criticized for exaggerating the importance of stereotype threat and for misrepresenting evidence as more conclusive than it is. internalize: To make something internal; to incorporate it in oneself. stereotype threat: The anxiety or stress a person experiences when they find themselves in a situation in which they could potentially confirm a negative stereotype about their social group. One of the most important social psychological findings concerning race relations is that members of stereotyped groups internalize those stereotypes and thus suffer a wide range of harmful consequences. Stereotype Threat is the experience of anxiety or concern in a situation where a person has the potential to confirm a negative stereotype about their social group. Since its introduction into the academic literature in 1995, Stereotype Threat has become one of the most widely studied topics in the field of social psychology. First described by social psychologist, Claude Steele and his colleagues, Stereotype Threat has been shown to reduce the performance of individuals who belong to negatively stereotyped groups. If negative stereotypes are present regarding a specific group, they are likely to become anxious about their performance, which in turn may hinder their ability to perform at their maximum level. Stereotype Threat is a potential contributing factor to long-standing racial and gender gaps in academic performance. However, it may occur whenever an individual’s performance might confirm a negative stereotype. This is because Stereotype Threat is thought to arise from the particular situation rather than from an individual’s personality traits or characteristics. Since most people have at least one social identity which is negatively stereotyped, most people are vulnerable to Stereotype Threat if they encounter a situation in which the stereotype is relevant. Situational factors that increase Stereotype Threat can include the difficulty of the task, the belief that the task measures their abilities, and the relevance of the negative stereotype to the task. Individuals show higher degrees of Stereotype Threat on tasks they wish to perform well on and when they identify strongly with the stereotyped group. These effects are also increased when they expect discrimination due to their identification with negatively stereotyped group. Repeated experiences of Stereotype Threat can lead to a vicious circle of diminished confidence, poor performance, and loss of interest in the relevant area of achievement. The opposite of Stereotype Threat is known as Stereotype Enhancement, which entails an individual’s potential to confirm a positive stereotype about their social group, and a subsequent increase in performance ability in the related task as compared to their ability prior to their exposure to the stereotype. Advocates of Stereotype Threat explanation have been criticized for exaggerating it and for misrepresenting evidence as more conclusive than it is. 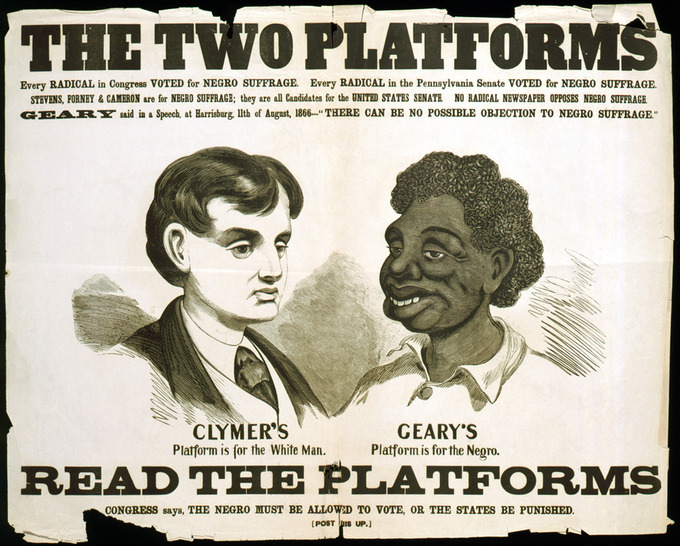 A Racist Campaign Poster: A racist political campaign poster from the 1866 Pennsylvania gubernatorial election. Psychological perspectives examine the effects of these kinds of propagated stereotypes.